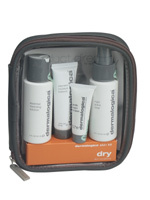 Skin Care Basics Kit (Dry) - Contains Multi-Active Toner, 2 fl. oz., Essential Cleansing Solution, 2 fl. oz., Skin Prep Scrub .75 fl. oz., Intensive Moisture Balance .75 fl. oz.